Calculation of the global heat and mass transport in industrial Cz growth setups is extremely complicated as several interrelated physical phenomena should be resolved simultaneously. 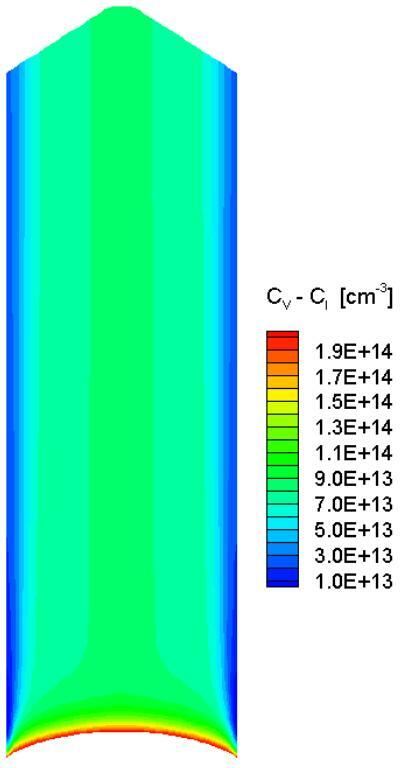 Engineering model of global heat transfer in the Cz systems that is currently used in CGSim includes self-consistent calculation of melt turbulent convection, inert gas flow and melt-crystal interface geometry. This model was used to study the effect of the inert gas flow on turbulent melt convection and global heat transfer in an industrial Cz system Leybold EKZ 1300 . 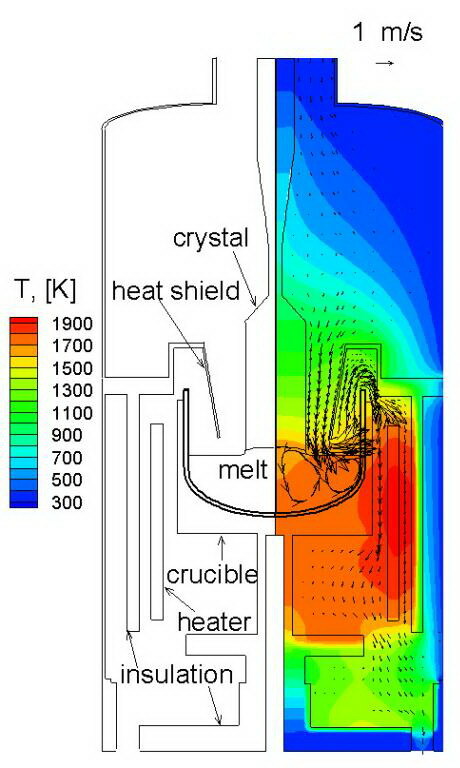 To illustrate the CGSim’s capability of handling such a complex task as heat simulation in Cz silicon growth, we compared the simulation results obtained using CGSim with the temperatures measured in the crystal as well as inside the lateral and bottom insulations, Figure 2 (a,b). 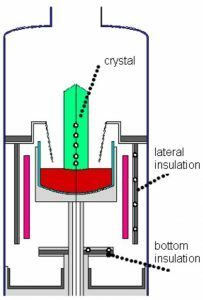 Detailed discussion of the experiment on the temperature measurements in the growing crystal carried out at Siltronic AG can be found in . Comparison of the results shows that CGSim can adequately predict temperature distribution in the industrial growth setup and inside the growing silicon crystal. Figure 2 (b). Verification of the temperature predictions by comparing the computational results with the experimental data obtained at the points shown in (a). Adequate prediction of the electrical properties of silicon depends on the accurate calculation of characteristics of point defects in the growing crystal that, in turn, depend on thermal regime during the crystal pulling and concentrations of impurities. Temperature gradients in the growing crystal are noticeably affected by the geometry of the melt-crystal interface, while the geometry itself is unknown a priori and is to be found during the calculation. 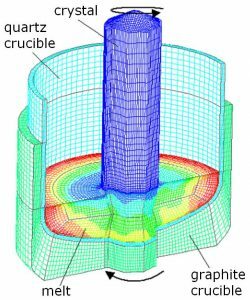 To predict the geometry of the melt-crystal interface, detailed thermal regime in the crystallization zone and eventually defect incorporation and evolution, we use 3D unsteady analysis of melt turbulent convection coupled with the heat transfer analysis in the crystal and the crucible. 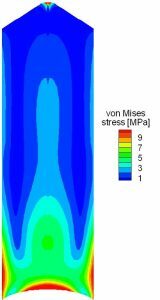 At the first step, we calculate heat and mass transfer in the whole system using 2D approximation. 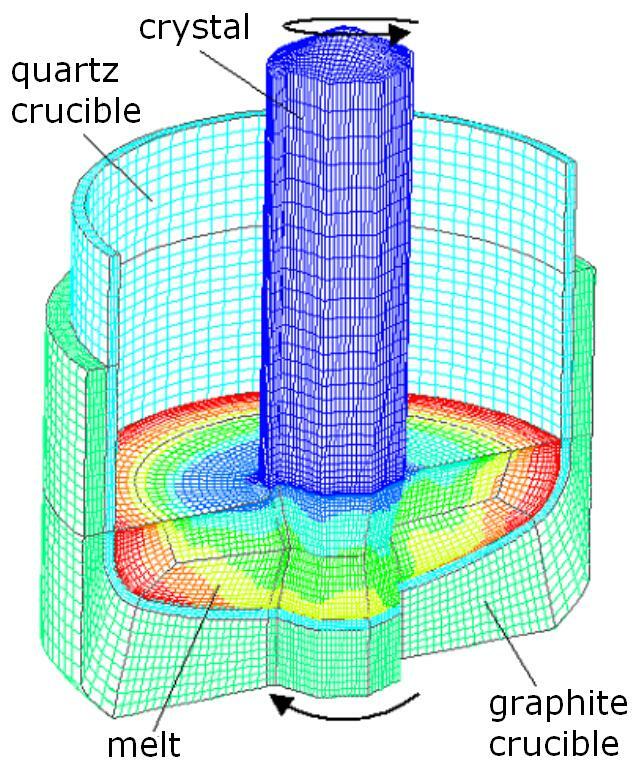 The results are used to set thermal boundary conditions for the 3D computations in the crystallization zone. One can see that 3D unsteady behavior of melt flow results in strongly asymmetric instant distributions of the crystallization rate over the interface and the temperature under the crystal, Fig. 4 (a,b). 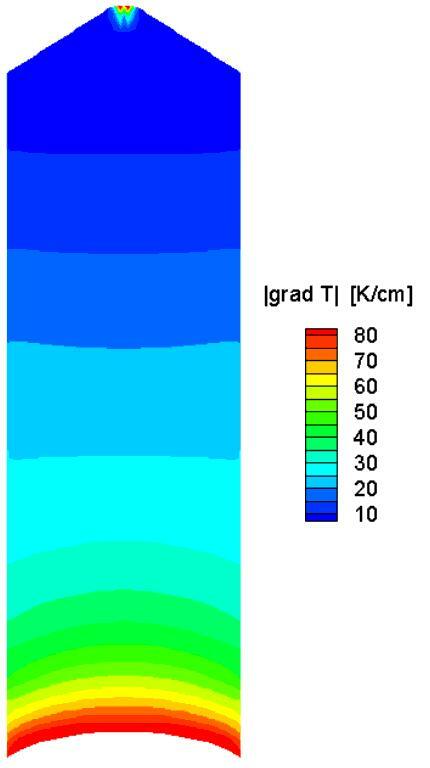 Accurate analysis of temperature gradients and thermal stresses is possible in Module Defects and in Flow Module. For predicting initial spatial distributions of defects in the growing crystal, a 2D model of vacancy and interstitial dynamics is applied. The model considers initial defect formation at the crystallization front and their further incorporation by convective and diffusive transport with clusterization and reciprocal recombination. The difference between vacancy and interstitial concentrations shows the type of dominating defects and the position of OSF ring, see Figure 5. 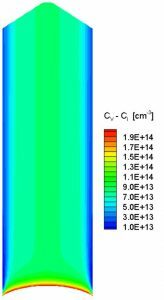 “Gas flow effect on global heat transport and melt convection in Czochralski silicon growth”, V.V. Kalaev, I.Yu. Evstratov, Yu.N. Makarov, E.V. Eskov, M.V. Nikolenko, V.S. Postolov, Journal of Crystal Growth 249 (2003) pp. 87-99. 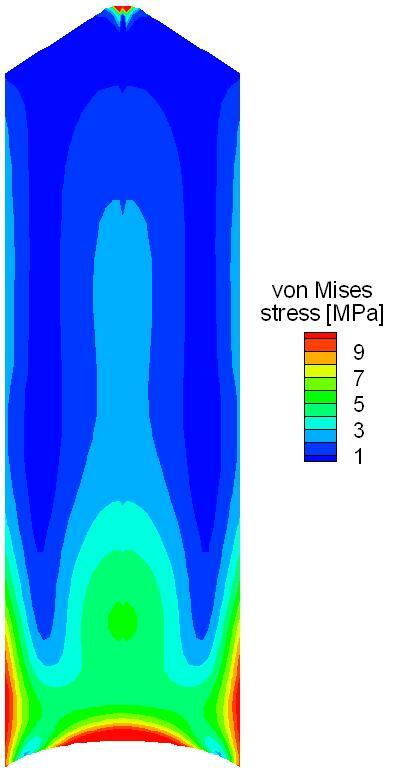 “Thermal simulation of the Czochralski silicon growth process by three different models and comparison with experimental results”, E. Dornberger, E. Tomzig, A. Seidl, S. Schmitt, H.-J. Leister, Ch. Schmitt, G. Muller, Journal of Crystal Growth 180 (1997) pp. 461-467.